What headwear are women legally required to wear in Iran? "Iranian law requires that a veil covering the hair be worn in public places by all women on its territory," the airline said. Wikivoyage says that "hijabs" are recommended in some areas, but that "headscarves" are required by law (which is presumably more than just a recommendation). 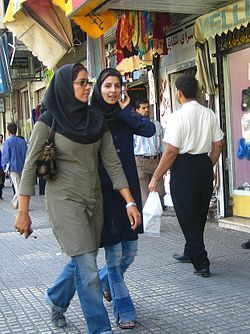 In Tehran and several bigger cities Western clothing and formality is accepted but wearing a hijab may be required in most of rural areas. Women by law must wear a headscarf in public. 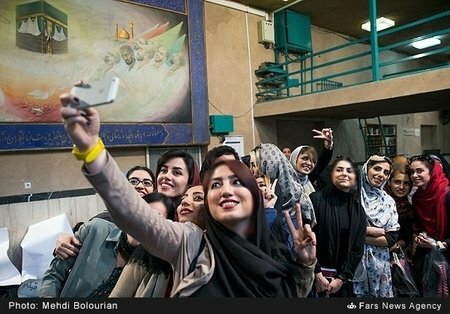 Are women in Iran legally required to wear a hijab, or merely required to wear some sort of headscarf, and if the latter, what is it called and what part of the woman does it cover? I had a read of What's the difference between a hijab, niqab and burka?, but it didn't seem to help. Related question: What is appropriate attire for women in Muslim countries? , but only this answer mentions Iran. I visited last year. My pure understanding of the law there obviously isn't perfect as an outsider, but the following of the 'law' seemed very rough, women would wear a covering, but sometimes only over the bob of a pony-tail, for example. However, if in a place of business, eg a hotel or restaurant, you'd regularly see proprietors or staff quickly address a woman who had had her hijab slip back or off a bit too far, usually apologetically - they didn't want to get into trouble themselves. There was a variety - you'd see headscarves, niqabs and hijabs, but the basic rule seemed to be - cover most of your hair, or get told off. This was in public, however, in the privacy of people's houses, these rules seemed to vanish. Head Scarf (roo-sary): This is by far the most widely used form. It usually consist of a square shaped fabric folded in half to form a triangle which covers the head and is fixed by a knot under the chin. This is not too alien to westerners as it was used in eastern Europe and some other parts of the west. The younger generation really gets creative with wearing this one. Maghnae See example This is a cone shaped fabric worn on the head and covers down to the shoulders, with and opening for the face. This is mostly used in the schools (both teachers and students) as well as pink collar jobs, nurses, offices workers, etc. Manteau (manˈtō): is a trench coat style of clothing that is supposed to cover the rest of the body in case a scarf or maghnae is worn. Pants: if the combination of clothing worn does not cover the legs, pants are required. Chador: (literally means tent in Persian) See example This is a more traditional form of Hijaab in Iran, that consists of a large piece of fabric that covers the entire body of the woman (may or may not cover the face depending on how it's worn). Neghab: (Face Mask) This is predominantly seen in some areas of the south in Iran, in pockets of traditional communities. 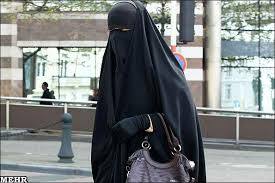 Burqa: (Face Vail) It is a piece of see through fabric covering the face. This was prevalent in urban areas of Iran more than a century ago, but is hardly ever seen today, especially in larger cities. the legally accepted attire of a woman can consist of a combination of what was mentioned. The Government endorsed definition of Hijaab is Maghnae with chador worn over it. 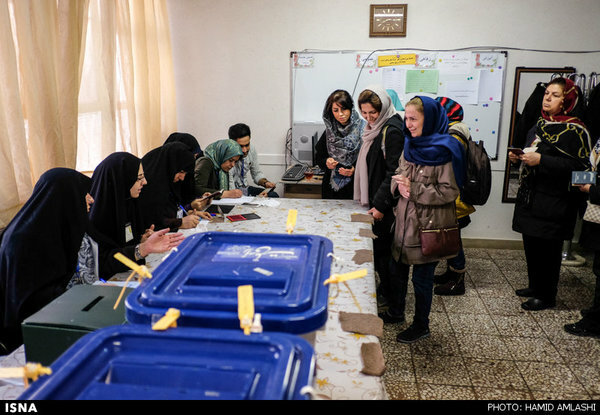 So while many places may be much more relaxed and not object to a loosely worn head scarf, going into government buildings (courthouses, state run offices, etc) does require chador and usually checks and provides them at the entrance. A head scarf covering the hair with a manteau worn on the body usually is sufficient for appearing in public and is legally valid. pants that were too short or tight. For the most part, people get away with not covering up properly as they push the boundaries of the mandatory Hijaab. The enforcement usually ramps up during election years and political turmoil. If you don't want to end up in the custody of the moral police, make sure you at least know the law and know how to get around it. Local women are usually great at navigating the system and can teach you how to do it. Company chiefs sent out a memo informing female staff they would be required "to wear trousers during the flight with a loose fitting jacket and a scarf covering their hair on leaving the plane", Mr Pillet said. That said, the female cabin crew usually do not need to wear hijab because it's unlikely that they leave the plane. The airplane lands, releases the passengers, refuels, gets new passengers on board and leaves. 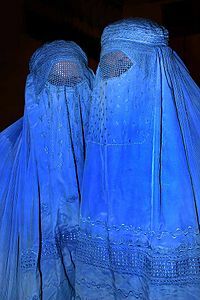 Chador - Nobody is obliged to wear that. The more religious a woman is, the more likely is that she wears it. But the opposite is not true, i.e. not wearing it does not necessary mean not being religious. So my recommendation is to go with headscarf, and wear it in a way that at least half of your hair is covered (like what you see in the pictures). That would also be better if the ears are not visible. Make sure the chest is not visible at all. It would be fine if you don't wear socks but no part of the leg should be uncovered. As for the hand, most of it should be covered, but I don't think it would cause any trouble if the wrist and part of the forearm is uncovered (as can be seen in the second pic). Legally, they have to wear Hijab, but hijab comes in many different styles, they do not approve of all styles, at least not the religious police. The favorite style for the religious police is called the chādor, which was somehow enforced by the religious police after the revolution in 1979. 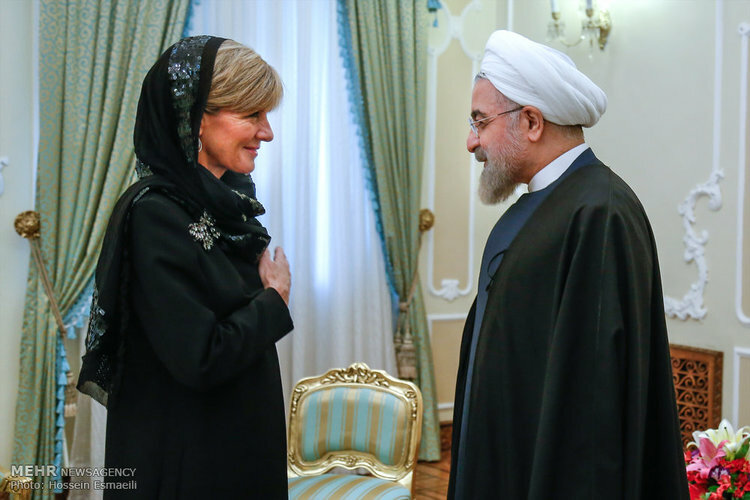 The Chador looks like the Niqab for the foreigners, but it's totally different, basically it's one way of identifying Sunnis from Shia'as in this part of the world, since conservative Shia'a women tend to wear it, even the ones outside Iran. Many young ladies in urban cities tend to wear the Arab style hijab, but they will be a target for the religious police for not being "decent" enough. So, to sum that up. The law requires that women wear Hijab, preferably the chador, since it's an old Persian style anyway, and it also covers most of the body, head and face. Women in public in Iran are legally required to cover up their hair, to wear long sleeves and long pants. How they achieve this is up to them. So, particularly in urban areas, many women only will wear a scarf to cover their hair, while in often more rural areas, you'll more likely see a chador. 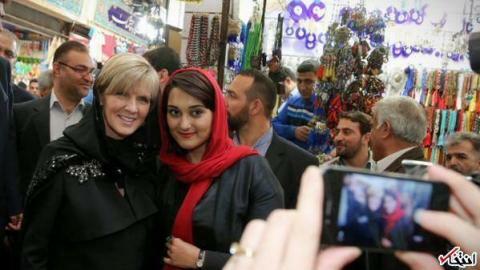 Any other clothing for this, like a niqab or burqa, is very uncommon in Iran. You might even spot a young woman or two wearing a cap, instead of a scarf. Wikipedia has a nice article on wearing hijab in Iran. So, to get back to the news article you mention, at least some initial news articles suggested the Air France cabin crew did not want to have to wear a headscarf while in Tehran, somehow seemingly requiring Air France to bend Iran's rules and regulations. At the same time, already on flights to Saudi Arabia and on flights to Iran, before Air France suspended their flights, it was possible for staff to choose not to fly on those routes, which is what Air France now also again is allowing on their reconvened flights to Iran. Some Air France staff questioned whether staff asking not to fly to Iran would affect their position as employees of Air France, which, it could seem, was what was underlying the whole brouhaha in the first place. Not the answer you're looking for? Browse other questions tagged legal clothing iran cultural-awareness female-travellers or ask your own question. What is appropriate attire for women in Muslim countries? What to wear in Egypt to blend in? Are non-Saudi women allowed to drive in Saudi Arabia? Are women required to wear skirts to get into some tourist sites? Is a male guardian required for women skiing in Iran? What gesture to make when hitchhiking in Iran? Are there accommodation embargoes for booking in Iran? What trousers/pants do women wear in Baltic cities in winter? What to wear in Switzerland in July?